A suburban picture palace on the brink of extinction, strangers dancing in the dark, a ‘headcase’ turned world leader, a woman who talks to animals, a freestyling busker and a kiwi pro wrestler – these are some of the characters Kiwis will be introduced to thanks to the outstanding selection of Loading Docs documentaries set to be made in 2015. After a selection process with an unprecedented high calibre of entries the Loading Docs team is pleased to announce the line-up of ten 3-minute documentary shorts to be produced and released in 2015 under the ground-breaking New Zealand film initiative. The filmmakers behind the selected ten comprise an outstanding line-up of filmmaking talent, some of whom have already produced award-winning short films. “Although the docos are only three-minutes long, that’s enough to spark the audience’s imagination and to provoke a powerful response… but it really pushes a filmmaker’s skills to the limit,” says Loading Docs EP Anna Jackson. Executive Producers Julia Parnell and Anna Jackson set up Loading Docs to fill a gap for audiences hungry for quality local documentaries and to offer documentary makers a unique creative challenge. The filmmakers are provided with mentoring from industry leaders to further their skills in development, crowdfunding, marketing and online distribution. The initiative is designed to support filmmakers to take their filmmaking craft to the next level and promote creative documentary making of the highest standard both locally and internationally. Loading Docs launched in May 2014. The first series of short docos (all freely available to view and share online here: www.loadingdocs.net/2014films ) were an immediate success, featuring on high profile local and international websites, screening on Air New Zealand’s inflight entertainment and New Zealand Television (3News, Seven Sharp, 20/20, Te Kaea, Iti Pounamu, the Rialto Channel) and selected for local and international film festivals (Show Me Shorts (NZ), Out Takes (NZ), ImagineNATIVE (Canada), New Zealand Short Film Festival (Aus) and the 2015 Banff World Tour (US). “Loading Docs has touched audiences all over the world with an outstanding selection of unique New Zealand stories. Given the success of our inaugural round of documentaries last year, we are looking forward to supporting another talented group through the process” says Loading Docs EP Julia Parnell. by Loading Docs. The crowd funding phase will take place from the first week of March 2015 when the filmmakers have a month to raise the cash and reach out to audiences before production begins. A suburban library hall on a mundane Monday is transformed into a world where there’s no inhibitions, no worries, and most importantly, ‘No Lights, No Lycra’. An adventurous, cinematic exposé of our cities’ hidden waterways and the story that connects us with our forgotten history and our unseen environment. Over hot drinks and a potluck afternoon tea, a group of senior Wellingtonians discuss the best ways to die. New Zealand, Japanese and French cultures merge in the vineyards of salaryman turned master winemaker, Hiro Kusuda. To the psychiatrists, Mary O’Hagan was just another head case. But where they saw illness, she saw meaning. Imagine if you could have a conversation with your pet… Faye Rogers can. A boombox and a beat helped Tihei Harawira find his voice. Now he’s freestyling his way from Otara to the world. The former king of New Zealand pro wrestling is challenged by his best friend to re-connect with his glory days of battle. Joel Kefali, LOADING DOCS Filmmaker (Baba) See the doco here. Alex Sutherland, LOADING DOCS Filmmaker (The Jump) See the doco here. Prisca Bouchet and Nick Mayow, LOADING DOCS Filmmakers (Today) See the doco here. 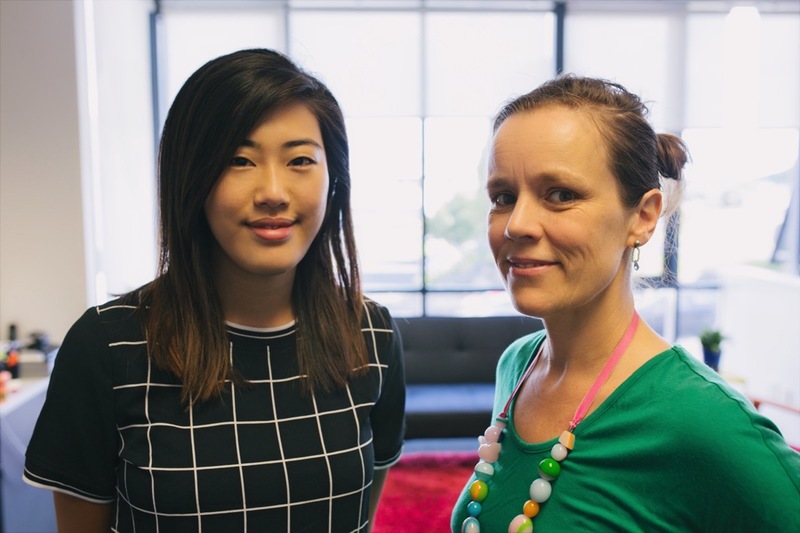 Hello from your Loading Docs team: Producer Nia and Production Manager Jean. I came on board with Loading Docs last year in November as Producer and am thrilled to be part of this incredible team for the 2015 batch of short docos. The short form documentary is an ideal framework for culture hungry people, perfectly composed for viewing on all devices at home or on the go. See our recent successes on the media page here. Jean and I are busily at work sprucing everything up for the year and we aim to advance the cause for New Zealand stories by delivering them to more eyes than ever before! We have ten brilliant films on the slate for 2015 which I am so proud to be able to represent and support through the process. I look forward to sharing the journey of creating these new documentaries with the teams we have this year and to share the stories with you as they come together over the next 6 months. Stick with us on this journey it is going to be a captivating ride.